What’s it take to build a successful biotech in New York? Teamwork, perseverance—and perhaps getting Roy Vagelos, the longtime Merck CEO, to head your board of directors. That was just one of the many takeaways from our latest biotech event, “New York’s Life Science Disruptors.” The packed house at the Alexandria Center for Life Science last Thursday got a candid, up-close look at some of the key figures trying to shape biotech in the Big Apple: from startups, to academics, to investors, to one of the top R&D chiefs in the business. How did the city’s academics put ego aside to form the New York Genome Center? What has Seattle’s Accelerator Corp. been seeing out of New York biotech since opening up an office here? How did Regeneron Pharmaceuticals (NASDAQ: REGN) come from a couple of Queens kids playing softball? Those questions, and many more, were answered on Thursday night. Big thanks to our speakers and moderators: Regeneron chief scientific officer George Yancopoulos; New York Genome Center CEO Robert Darnell; Kadmon CEO Sam Waksal; Acorda Therapeutics CEO Ron Cohen; Harris & Harris Group managing director Misti Ushio; Accelerator CEO Thong Le; and CNBC biotech reporter Meg Tirrell. Thanks also to our event host Alexandria Real Estate Equities, and our sponsors: Halloran Consulting Group and Guard Dog Brand Development. A tip of the cap as well to Keith Spiro of Keith Spiro Photography for the photos (more of those coming later this week). With that, on to some takeaways from a fun night in New York City. 1. Genomics is so daunting, it made New York institutions collaborate. It’s no secret that New York’s many medical institutions and universities used to be more competitive than collaborative. Along with lack of affordable lab space, this has been one of the big things that has held the area back from becoming a top biotech cluster. 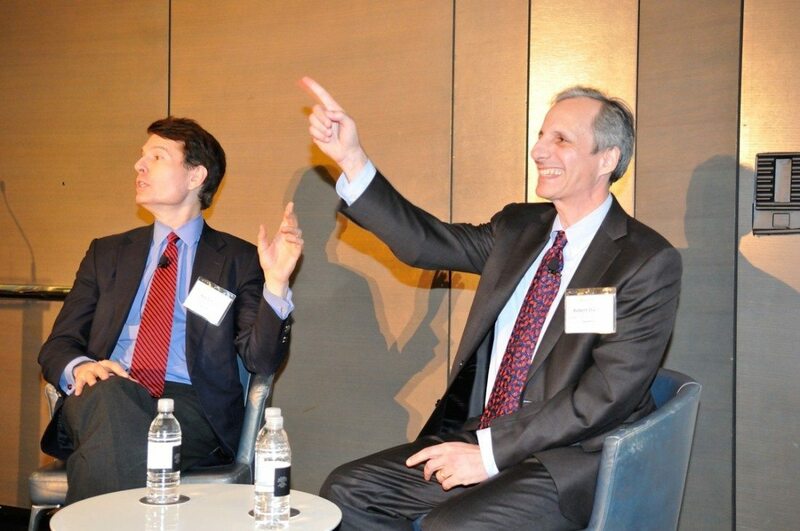 Many factors have helped change that over the past decade or so, but one of them, Robert Darnell (pictured above, right, with Ron Cohen) said, is genomics. The best way to overcome that problem? Work together. So 12 of New York’s institutions each put $2.5 million up to seed the NYGC, pool their research, and create what is now a cross between a biotech startup and an academic institution. Darnell said that broad team effort is what makes the NYGC unique to the nation’s other large genome centers. “The scale of what needs to be done is what’s driven this collaborative nature,” Darnell said. 2. Here’s how all of this research can actually impact people. Darnell told a story the NYGC aims to duplicate several times over: going from knowing nothing about a cancer to finding a potential drug for it in 12 months. A patient with a rare kind of liver cancer—“nothing, zero was known about this cancer,” Darnell said—decided to do something about it. She went on the Web to find others with that specific cancer, communicated with 10 others that did, and got tissue samples. She had those samples first sequenced by a lab at Johns Hopkins University (the results came up empty), and eventually by the NYGC—which did a more expensive, and thorough sequencing of all of their DNA.